Vancouver, B.C. 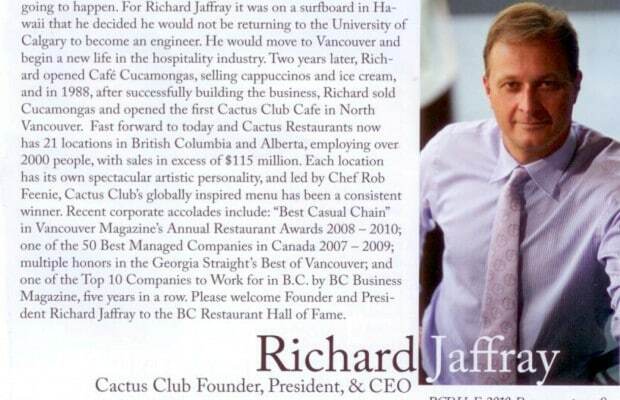 – Cactus Restaurants Ltd. president and founder Richard Jaffray was inducted to the BC Restaurant Hall of Fame this week during the organization’s annual gala honouring the best of BC’s culinary industry. The awards ceremony recognized 11 individuals in five categories: Active Restaurateur, Industry (front and back of house), Pioneer and Friend of the Industry. Jaffray’s induction into the Active Restaurateur category celebrates his 25 year career in the restaurant industry and the success of the Cactus Restaurant brand. Jaffray’s ambition for a career in the restaurant industry began on surfing trip to Hawaii with friends. After returning home and realizing engineering was not his calling, he lived out of the back of his car and later a sailboat while opening his first restaurant in Vancouver, Café Cucamongas, selling cappuccinos and ice cream. In 1988, after successfully building the business, Richard sold Café Cucamongas and opened the very first Cactus Club Cafe in North Vancouver, BC. Over 22 years later, Cactus Restaurants has emerged as the leader in casual fine dining, with 20 locations in British Columbia and Alberta, employing over 2000 people with sales in excess of $115 million. In 2010, Cactus Club won Gold – Best Casual for the third time straight for Vancouver Magazine’s coveted annual restaurants awards and was also awarded the Green Table Award by Where Magazine. In addition, they have been named to Canada’s Best Managed Companies, Canada’s Top Employers for Young People, Best Company to Work For in BC (#3 in 2009, #2 in 2008) and Top 10 Employers in BC. Jaffray’s personal passion for surfing and the environment has also fuelled his commitment to the community and sustainability. Through his vision, Cactus Restaurants has become the largest collection of restaurants to join the Vancouver Aquarium’s celebrated Ocean Wise program (a highly acclaimed fish conservation program that endorses fish selections as being ecologically sustainable). Richard also serves on the Vancouver Aquarium’s Board of Advisors. Cactus Restaurants is also a founding member and the first multi-unit restaurant group in Canada to be members of the Green Table Network (a conservation initiative that is based on a set of operating standards and targets that define a “green restaurant”).